The Tax Cuts and Jobs Act (“TCJA”) signed into law on December 22, 2017, resulted in some significant changes to the U.S. income tax code. As of taxation year 2018, individuals are seeing changes in tax rates, suspension of the personal exemption, an increase to the standard deduction, and a reduction in the amount and types of itemized deductions allowable. Some changes may also impact business owners of pass-through entities and Canadian corporations. All but two of the personal tax changes will expire on December 31, 2025. Income Tax Rates: Beginning in 2018, although the number of tax brackets has not changed, there has been a reduction in tax rates – the top rate has decreased from 39.6% to 37%, and is applicable at taxable income levels of $500K or higher (or $600K and higher for married taxpayers who file jointly). The current tax treatment and rates for capital gains and qualified dividends have not changed, with tax rates of 0%, 15%, and 20% – depending on taxable income level. Personal Exemptions: that taxpayers could claim for themselves, their spouse and dependents ($4,050/exemption in 2017) have been repealed beginning in 2018. Itemized Deductions: Substantial changes have been made to itemized deductions that can be claimed. State and Local Income Taxes, and Real Estate Taxes: The aggregate deduction for both state income tax and property taxes is capped at $10,000. Foreign property taxes are no longer deductible. Mortgage Interest Deduction: A deduction is allowed for mortgage interest related to new home acquisition loans of up to $750,000, instead of the previous $1 million, unless the loan was entered into before December 15, 2017. The deduction for interest on home equity indebtedness has been repealed. Medical Expense Deduction: is limited to medical expenses in excess of 7.5% (instead of 10%) of adjusted gross income (AGI) for 2017 and 2018 tax years. After 2018, the 10% AGI threshold will return. Charitable Contributions: The adjusted gross income limitation on cash contributions to public charities and certain private foundations has been increased from 50% to 60%. Any contributions in excess of the 60% limitation can be carried forward for five years. Miscellaneous Itemized Deductions: including tax preparation fees, investment advisory fees, and employee business expenses (e.g., mileage, travel, home office expenses, union dues, etc.) are disallowed. Personal Casualty Losses: are no longer deductible, subject to certain exceptions related to losses incurred in a federally-declared disaster area. Overall Limitation on Itemized Deductions: The phase-out of itemized deductions based on a taxpayer’s adjusted gross income (the “PEASE” limitation) has been repealed. Alimony Payments: are no longer deductible to the payor or taxable to the recipient, effective for divorce or separation agreements executed after December 31, 2018. Moving Expenses: are no longer deductible, while moving expense reimbursements are now taxable to the recipient. Child Tax Credit: has increased from $1,000 to $2,000 per child, $1,400 of which is refundable. The credit begins to phase out at the adjusted gross income of $400,000 for joint filers (up from $110,000), and $200,000 for single filers (up from $75,000). Taxpayers must now provide a social security number for any child for whom a child tax credit is being claimed. A $500 non-refundable credit was also introduced for non-child dependents. Estate Tax Exemption: doubled to $11.2M per individual and $22.4M per couple in 2018. Pass-through Deduction: Certain non-corporate owners of sole proprietorships, partnerships, S corporations, and limited liability companies may be able to deduct up to 20% of their “qualifying business income.” There are numerous limitations on the income eligible for the deduction. A taxpayer cannot claim the deduction if performing services as an employee, and restrictions also apply on businesses performing services in certain fields (e.g., health, law, accounting, consulting, financial services, performing arts, etc.). 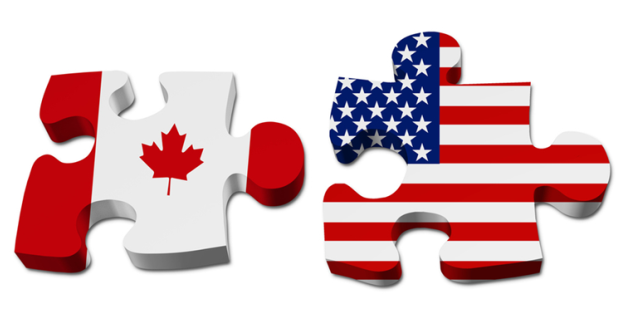 How a Canadian corporation is classified under U.S. tax law is an important determination for the U.S. citizen/U.S. resident business owner, particularly if the Canadian corporation is classified as a controlled foreign corporation (CFC). A foreign corporation is a CFC if its 10% U.S. shareholders collectively own more than 50% of the total combined voting power or 50% of the total value of the stock of the corporation. The CFC rules are an anti-deferral regime to prevent U.S. citizens and/or residents from indefinitely deferring U.S. income tax by placing investments and earning income in foreign corporations that they control. Below are some changes introduced by President Trump’s TCJA. Definition of a U.S. Shareholder: Under prior law, the definition of a U.S. shareholder for purposes of the CFC test was limited to a U.S. person who owns 10% or more of the total combined voting power of all classes of stock entitled to vote. Effective for tax years beginning after December 31, 2017, the definition has been expanded to also include a U.S. person owning 10% or more of the total value of all stock of a foreign corporation. The expansion of the definition means that more corporations may now be classified as CFCs. Global Intangible Low-Taxed Income (GILTI): A U.S. shareholder of a CFC is required to include his/her pro rata share of the CFC’s “Subpart F income” on his/her U.S. return annually, regardless of whether a distribution is actually made to the U.S. shareholder. Subpart F income generally includes interest, dividends, rents and royalties, and personal service contract income. The Subpart F provisions still apply; however, the new GILTI provisions further expand the type of income that is no longer eligible for tax deferral. A U.S. shareholder is now also required to include in income annually the excess of the CFC’s income (excluding Subpart F or U.S. effectively connected income) over 10% of the adjusted tax basis in its depreciable tangible property. This may create a significant impact on service companies and any company without significant tangible (fixed) assets on their balance sheet.